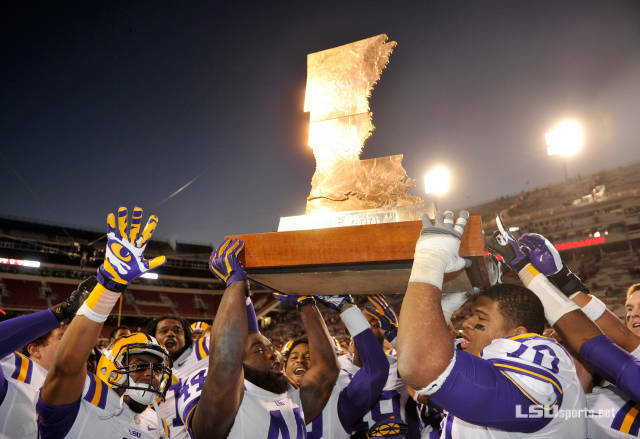 LSU players with the Golden Boot, I believe after last year’s game. I updated the records in my LSU/Arkansas blog and added a brief game summary for the game yesterday. Of course, I’m glad LSU won this last game, but I’m also glad Arkansas represented themselves well. It wasn’t good for my nerves, but it just wouldn’t have felt proper for this to be an easy win. I mention in my blog how often in the last 13 years it’s been a close game, so this was fitting. I wouldn’t mind if Arkansas got a good team again, but sometimes there are too many good teams in the SEC, especially as long as LSU has to play Florida every year along with the SEC West slate. The Gators will be back too. I also liked that LSU usually played Arkansas in Little Rock since the campus was less lively with it being Thanksgiving weekend. I imagine LSU people who traveled to the games liked them being closer as well. The late great George Carlin did a bit about football vocabulary versus baseball. Baseball is played at a park. Football is played on the gridiron in places like Soldier Field and War Memorial Stadium (which is what they call the one in Little Rock). I went to my first game at the L.A. Colliseum last year. There is just something special about stadiums like that. “War”, as I understand the locals call it, was built around 20 years later, but it’s a similar type of severe concrete architecture. I think the Arkansas fans treated it as something special as well. I can understand it, and it will probably work out though. We’ve played Auburn (often in September, but Mississippi St. and the non-conference slate will bump them to the first week of October next season) and Florida (usually in the second week of October) early on in recent years, and we don’t need another big game so early in the year. Also, Texas A&M lost their traditional Thanksgiving game with Texas, so they have to play somebody. Missouri should be a good game today; but it’s not a bordering state, and there isn’t a meaningful history between the two schools. As for Missouri, they’re really out of place being forced into the same division with Florida, Georgia, and South Carolina in particular, so giving them and Arkansas a close geographic annual rival makes a good bit of sense. Arkansas isn’t the most natural fit in the SEC West either. Their closest divisional opponent is Ole Miss, a six-hour drive away from the Arkansas campus. (Not that LSU is situated that much better in reference to other schools.) Also, interestingly enough, Tom Dienhart, who wrote to argue for Arkansas to join the Big XII seven years ago (he wanted them to kick out Baylor), got one of the match-ups he wanted after all. Arkansas was sort of a replacement for Tulane (even though they overlapped a few years) anyway, and LSU wouldn’t have been playing the Razorbacks every year if it weren’t for the previous SEC expansion. It became a fun, back-and-forth, competitive series like many of the more long-term and consistent rivalries seem to be. I’ll miss that, along with the other quirks I mentioned. Maybe something similar will develop from the Texas A&M series. The one this year was better as an LSU fan, but maybe there will be some more like last year to entertain the more neutral fans. I hope they make it at night after all the NFL games end. One thing I didn’t like about the Arkansas series was when it was played at home for LSU, it was often one fewer night game. I also wasn’t thrilled that this season’s game against Texas A&M was during the day, not that I wasn’t satisfied with how that one went. Also, it’s not like LSU will stop playing Arkansas. That game is set for November 15 next year, apparently in Fayetteville. It could still be an important part of the schedule for either team. Not really relevant to LSU, but I also thought it was interesting that the Hogs will play the Aggies in Jerry World in late September. One Alabama voter short of another tie at #1. Another change at #4, but it will probably be temporary again. As mentioned in the caption, the only thing that changed at the #1 spot is that we have one fewer Alabama voter this week, so the Tide fell behind by a single point after being tied last week. Baylor fell all the way to #13. Ohio St. picked up some support as a result and is now only a couple of points behind Alabama. But I have a feeling that will change if Alabama beats Auburn, the new #4, anyway. After beating UCLA and securing the Pac-12 South title, Arizona St. went up as much as Baylor went down. The Bruins fell 8 spots, even falling behind USC. LSU’s win over Texas A&M only moved the Tigers up two spots, but it moved the Aggies down 7 spots. This enabled Northern Illinois to remain #14 despite Arizona St. moving ahead of the Huskies. Notre Dame, which beat USC, is a distant 25th after Duke, but it’s an improvement over receiving no votes last week. The “others receiving votes” category is still small with only three teams, two of which only got a single point apiece. By turkey, of course I mean football and the coming bowl season. The bird isn’t anything to get excited about really, but it can make an excellent sandwich to accompany football-watching. First of all, I wanted to remind my All-Blogger voters to get their submissions in. About half of the ballots are still missing. None will be accepted after the first game kicks off on Thanksgiving, which is right about the time I plan to post it. LSU-Arkansas (Friday on CBS) will be an afterthought among all the interesting games in the next few days, but I originally wrote this blog back in 2006, and it’s what touched off my successful (for me, anyway) Rivalry Series. So if you have any interest at all, please check it out. Sometimes I wonder if articles are written for Bleacher Report just to annoy me. I used to suspect the same thing of Sporting News. Not me in particular, but they want to get under fans’ skin to get more hits. Brian Pedersen is a “Featured Columnist” on the site, and based on the way his “Which Teams Got Screwed in Week 14 Standings?” column is written, he doesn’t understand how the BCS rankings work after 15 years. The rankings will cease to exist in a couple of weeks. Have some respect. > So let me get this straight. Getting “screwed” means not moving up ENOUGH after beating an FCS opponent? Does it not occur to him that Missouri beat a ranked Ole Miss team. Maybe there are times when beating a ranked team should move you ahead of someone even if that other team doesn’t lose. Is that so hard to imagine? I know a few other teams beat Ole Miss, but let’s review who they were: Alabama, Auburn, and Texas A&M. Ole Miss has beaten LSU, Texas, and Vanderbilt. Even if you’re not convinced Ole Miss is a good win, let me float this idea: Maybe Clemson shouldn’t have been ahead of Missouri in the first place. This doesn’t convey a highly fundamental misconception of the BCS. Maybe he figured the pollsters would penalize Missouri for what they knew would be a boost in the computers, I don’t know. But wait for it. > He then mentions South Carolina didn’t lose ground after a similar game. NEITHER DID CLEMSON! He also mentions LSU climbed after beating an FCS opponent “and not just because teams above it lost”. Staying at 13th isn’t climbing. Missouri lost to a team called South Carolina. Guess what Clemson can do if they belong ahead of Missouri? •	But did the (Baylor) Bears‘ loss to Oklahoma State—arguably the hottest team in college football right now and currently ranked seventh—justify dropping from fourth to ninth? >> Falling 5 spots after being blown out seems reasonable to me. LSU was in the Alabama game until the fourth quarter, and they fell 8 spots. This is the same guy who tries to argue there is a double standard in favor of the SEC. If anything, if you’re further down to begin with, losing to a top team shouldn’t hurt you as much. >> Another big complaint seems to be that Stanford—which beat Arizona St., Washington, UCLA, and Oregon—passed up the Bears. Let’s review Baylor’s best four wins: Oklahoma… Texas Tech, Buffalo, Kansas St. Utah went downhill since beating Stanford, but they’ve played all the best teams of both divisions (not to mention BYU and Utah St., both of whom they beat) and some of the losses were very close. Stanford just happened to be their lucky game. South Carolina might pass Baylor if they beat Clemson (which would at worst be their second win over a 2-loss team). I think that MAYBE trumps Oklahoma and Texas Tech perhaps? •	Michigan State (10-1) is locked into the Big Ten title game, where it will have a chance to earn an automatic BCS bid if it were to beat Ohio State in Indianapolis in two weeks. >>> And best of luck to them. What’s the problem? Oh, they DIDN’T pass up the likes of Clemson and Baylor. So, the team that stays behind Clemson and Baylor got screwed. Clemson and Baylor also got screwed by not staying ahead of all the teams they had been ahead of. Wow. South Carolina is also ahead. He then mentions how Michigan St. should get more credit for winning its division. Baylor isn’t in a division. Michigan St., unlike Clemson, isn’t in a division with Florida St. Maybe he has a point with South Carolina (which won’t win its division unless Missouri loses to Texas A&M), but not if South Carolina beats Clemson. •	Fresno State (10-0) gave its home crowd a powerful sendoff by putting up 69 points against New Mexico on Saturday, getting 820 yards of total offense and seven touchdowns from superstar QB Derek Carr [but fell behind Northern Illinois]… You can probably chalk that up to NIU getting ESPN exposure on weeknights the past two weeks, while FSU was on the lesser-watched CBS Sports Network. >>>> This is that one shining moment you’ve been waiting for. I seriously doubt a whole lot of voters dropped Fresno St. In fact, their points in both of the BCS polls went UP (maybe a little less than Northern Illinois’); but you know those computers? They don’t get impressed by scores, because the NCAA mandated that the computers couldn’t factor that in. They also don’t care what channel the games were played on. They care that Northern Illinois beat a team with only one other loss (Ball St.) and then another (Toledo) who had been 7-3. Before beating New Mexico (3-8), Fresno St. had a bye week. Those mean computers want you to prevail over actual competition. For shame! There was some griping about Central Florida and Duke, not completely without merit. But it’s just reality that when it’s 2/3 human polls, they’re not going to start supporting teams that have been out of the spotlight as quickly as you might like. Central Florida wasn’t realistically going to go ahead of undefeated Northern Illinois and Fresno St., but they don’t have to worry about that since all they have to do is win their conference anyway. Duke (with two losses) is behind a few teams with three losses. Maybe they have an argument to be ahead of USC, UCLA, or both; but do we have to pretend the SEC West is roughly equivalent to the ACC Coastal? Finally, he complains about Cincinnati, with the worst schedule in college football other than possibly Old Dominion, which played mostly FCS schools. Cincinnati was absolutely destroyed by Illinois. The Illini have three other wins, but none of those victories were against teams with a single FBS win of their own. The Bearcats also lost to South Florida, whose one other FBS win was over Connecticut. Cincinnati did beat SMU, Rutgers, and Houston in consecutive weeks, but that doesn’t make up for those losses. The best win before those? 3-7 Memphis. The same guy also did the bowl projections for this week. I know this will come as a shock to fans of the Stanford Cardinal, but even if they beat Notre Dame, the chances of playing for a national championship are approximately 0. He also assumes Texas will beat that great Baylor team he complains about and play Texas A&M in the Cotton Bowl since LSU has three losses. Uhhh, Texas A&M does too; and furthermore, he projects Missouri to beat the Aggies! I had been wondering who to cheer for in this game since I think I might like to see South Carolina play Auburn or Alabama more than Missouri, but it’s clear now. The thought of LSU getting passed up for the Cotton Bowl again despite beating A&M again is a bit frustrating for me, so I’ll be cheering for all three SEC Tiger teams. Another change to #4, but the rest of the top 3 remains the same. Of course, #2 plays #3 next week. First of all, I’ve updated the LSU/Texas A&M Rivalry blog to reflect yesterday’s results. This is the first week I remember where I have the same members of the top 25 as the AP poll. Different order of course, but I guess it’s just more obvious than usual. I think the blogger poll last week with only three members of the “others receiving votes” category was another indication. The main point of my computer rankings is trying to get the right teams at the top. If the seasons were over for Ohio St. and Florida St., they should play in one semifinal with the winner playing the winner of the Iron Bowl. Seems right to me. Missouri could possibly pass up the Buckeyes, but since either Alabama or Auburn will lose, that probably will not cause a problem. Arizona St. is interesting. Arizona would now count almost as much as Michigan would for Ohio St. I don’t think Stanford would count for that much more than Michigan St., but Stanford still has Notre Dame to play. It’s something to watch at least. Also, it’s a reminder of why I need to make sure losses hurt a team more than wins help a team. Speaking of which, I think LSU would beat the lowest 5 teams ahead of them (at least), but the idea is three losses should put you a decent distance outside of title contention. Why so many spots? Well, the distance between Oklahoma at #15 and LSU at #23 in terms of points is less than that between #1 Florida St. and #4 Ohio St. Fifteenth or maybe even 20th without better wins (other than Auburn and Texas A&M, LSU hasn’t beaten anyone else in the top 70) is too high for a 3-loss team at this point, especially when two of the losses were against unranked teams. But if LSU were to win a bowl game against a good team (after beating Arkansas, of course), they could climb up into that range. Anyway, I’m still glad in a way that LSU could be ranked again after falling so low. It stops me from seeing my formula as overly punitive of losses. I realize Notre Dame is a little higher than LSU despite also having three losses. The losses are similar, but the Irish have wins over three ranked teams: Arizona St., Michigan St., and USC. LSU only has wins roughly comparable to Arizona St. and USC. Also, the best unranked team LSU has beaten is all the way down at #66 (Mississippi St.), while Notre Dame has beaten two additional teams in the top 60 (Navy and BYU). I guess I should also address Texas A&M and USC. The Aggies don’t have any wins over top-25 teams. Their best wins are Ole Miss, Vanderbilt, Rice, and Mississippi St. The losses, to the three other ranked SEC West teams, are better than either Notre Dame’s or LSU’s, but that alone isn’t enough to put them higher. USC’s loss to Washington St. isn’t that bad at this point. The Cougars have risen to #51, not much lower than Pittsburgh. Arizona St. and Notre Dame are of course ranked in the top 25. Although it doesn’t have enough big wins to surpass Notre Dame, USC does have the big win over Stanford. The Arizona win over Oregon this weekend was also beneficial (USC played Arizona but not Oregon). Boston College Is close to being in the top 40, so that’s a win that’s surprisingly helpful. I think you can follow the logic to see why UCLA is the 5th-best 3-loss team in my rankings. I also like that Baylor stayed in the top 10. I think my formula does well to place them there. I can see people being unhappy with Michigan St.’s position, but the Spartans have lost to the only ranked team they’ve played (Notre Dame), and the best team they’ve beaten is now Minnesota. Michigan and Nebraska are not far behind, but that’s not a top-10 resume to me. Had the Spartans had another bye week instead of the loss to Notre Dame, they would be #8 though. Had they beaten the Irish, they would be in the top 5; but I’m not sure how high. There were nearly two ties in the top four alone, but Ohio St. edged Baylor by one point for #3. Apologies for getting this out so late. Sometimes real life gets in the way of maintaining a blog. It was about 1 a.m. on the east coast last night when I tried to prepare this and then realized there was no good reason to try to post it when most people weren’t going to see it until today anyway. We have our first tie for #1. The only reason Florida St. is on the left in the picture above and listed first is they got 3 first-place votes, and Alabama only got two. The reason it ended up a tie anyway was only one voter had Alabama lower than second. Two had Florida St. lower. Ohio St. got two first-place votes, but four voters ranked the Buckeyes either fourth or fifth. The other voter had them #3. Baylor, despite no first-place votes, finished only a point behind. There were seven voters again this week, the same voters as there were last week. Even though I think Stanford is more deserving than Oklahoma St., it’s still a good top 10. 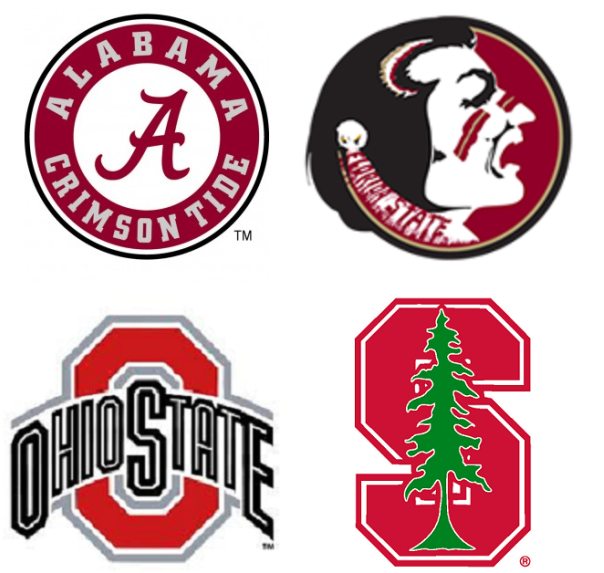 It might be the ten teams you’d least want to play. On the other hand, Texas A&M might have been in there by that standard, especially if you’re more defense-minded. I’d say the teams the voters least knew how to handle were UCLA, Wisconsin, LSU, and Arizona St. One reason for Wisconsin/Arizona St. is Wisconsin should have been able to kick a winning field goal had the quarterback spike the ball instead of put the ball down while in a kneeling motion. Some voters treat that almost as a Wisconsin win; but if you look at the official wins and losses, it’s a good out-of-conference win for a team that also plays in a strong conference. The apparent strength of the win over Wisconsin (not to mention the win over USC) has increased lately. UCLA has a similar profile to Arizona St., but their non-conference win was without controversy (although against an apparently weaker team), and the Bruins don’t have a non-conference loss. There isn’t a strong win to get excited about for UCLA. On the other hand, the losses are nothing to be ashamed of either. LSU was put in its place in the fourth quarter against Alabama (after failing to take advantage of playing better than the Tide did in the first half), but the other losses were really close games on the road, so you can look at them as losses to mediocre teams (at least teams with their own share of losses) or good games that just didn’t get a good result. Even though Georgia’s team was depleted by injuries and had a bad-looking loss to Vanderbilt, it looked like they were going to beat Auburn last week. They just had one of their more fortunate performances against LSU. I’m not saying anything bad about Georgia. I’m sure they’d be happy to take the loss to LSU in exchange for a few more wins. Ole Miss had three conference games in October that were decided by a single possession apiece. It so happened they won the one against LSU. The only other loss is to Alabama the week before the loss to Auburn. The Rebels played both teams from Alabama on the road. Speaking of Ole Miss, the Rebels were the last team out at #26. Interestingly enough, two teams are coached by former Ole Miss head coaches made their first respective appearances. Ed Orgeron is the interim head coach at USC; and David Cutcliffe, his predecessor at Ole Miss, is the head coach of Duke. Maybe if Cincinnati win a couple more games, yet another team coached by a former Ole Miss head coach (Tommy Tuberville in that case) will make it in. As most of you know, I usually talk about college football, so if that’s what you’re here for, feel free to check out the LSU/Texas A&M Rivalry blog. I know most people don’t talk about NFL Realignment since the teams haven’t changed in a while, but I just think it would make sense. I think there are a lot of fans who end up watching weird games because many of the divisions don’t fit well on the map. I don’t think anyone will listen to me, but I thought it was nice to think about. Let me just start out with a map of how I think it should look, and I’ll have some discussion below. Each division has its own color, except both of the East divisions are included in the (darker) blue area. The Saints and Falcons, rivals since the Saints’ first season in 1967 (which was the Falcons’ second season), stay together. It makes a lot of sense to break up the current AFC South. A division stretching from Jacksonville to Houston to Indianapolis for the sake of keeping everyone in the same conference was silly. If it’s not immediately obvious, I’ll explain why the Dolphins were left out below, but I thought at least two of the Florida teams should stay together. Tampa Bay has already been playing in the same division with Atlanta and New Orleans. I know the first three teams are used to playing the Cowboys, but I think they’ll get over it. It just makes too much sense in my opinion to have Baltimore playing Washington and Philadelphia in particular. I can only really talk about my own experiences as a Saints fan in how I look at such changes. I did have a bit of nostalgia for the regular 49ers games over the weekend, but it just didn’t have much to it beyond football. Atlanta, on the other hand, goes a lot deeper. If you’re in New Orleans, you probably know people in Atlanta or from Atlanta. There is a lot of overlap of the two fan bases, not only in moving from one city to the other but also in places like Alabama. When the Rams moved to St. Louis, that instantly added a lot of fuel to the rivalry because even though it’s not as close as East Coast cities, St. Louis is still considered a nearby big city and there was a lot of interplay between Rams fans and Saints fans. Anyway, you get over playing an opponent just because you’re used to it. I think with the logical passions that would develop in the actual geographic area, the Cowboys would be forgotten fairly easily. As for the Ravens, I think the fact that Cleveland and Cincinnati were not natural rivals added to the intensity of the rivalry with the Steelers. But if you remember, that developed fairly quickly. It hasn’t even been 20 years since football returned to Baltimore. The NFC North (Minnesota, Green Bay, Chicago, Detroit) should remain the same. A lot of people in Texas don’t seem to have noticed they have another team yet. Maybe by having the Texans play the Cowboys, people will realize this. I thought it was a really good fit to combine the two Texas teams with the two Mountain time zone teams. The Cardinals are technically in the Mountain time zone all year, but I do realize they’re two hours off for the first couple of months of the season since most of Arizona does not observe Daylight Savings Time. Other than habit, I don’t see how it makes sense to have two teams in Texas and insist they play in two different conferences and also to have two teams in Missouri and insist they play in two different conferences. Since Texas makes a lot more sense with Arizona, I decided to put that pair in this division. Basically, you have the two Ohio teams, and then you add a team from either side of the state. Pittsburgh, Cleveland, and Cincinnati have been playing one another as long as I remember. I clearly remember the Houston Oilers being in that division. Other than trying to break up the AFC East or NFC North, there is no other place that makes sense for the Colts. I just mentioned the old AFC Central (Cleveland, Cincinnati, Pittsburgh, Houston), but I couldn’t think of a better name for this one. St. Louis and Kansas City are naturals, and Tennessee and Carolina are more leftovers, but that could be a good rivalry too. Tennessee does border North Carolina. I also toyed with trying to put everyone but Kansas City in some kind of Southern division, but ultimately either the AFC North or one of the Eastern divisions was going to need a Southeastern team, so I went with the Dolphins since they’re already in the AFC East. They’re all in the in-between zone between the North/Midwest and the Deep South. Like the NFC North, this one remains the same. I already explained why I decided to leave Miami here. It’s the only spot on the map that doesn’t make any sense, but I couldn’t see any logical way to change this. The 49ers preceded the AFL by only about 10 years, and the rest were all AFL teams. I know the 49ers have been in the NFC the whole time, but Seattle would be back where they belong, in my opinion. The 49ers and Seahawks are already familiar with each other from recent years, and I think it would be fun seeing the rivalry between the Seahawks and Raiders renewed. Chargers/Seahawks won’t get anyone excited, but San Diego will still be playing Oakland, and San Francisco would be an added bonus. I think that would make up for the loss of Denver (a good ways away from San Diego anyway), and Kansas City was never the best fit with the West Coast teams. Based on the discussion in the comments, I have a compromise map. 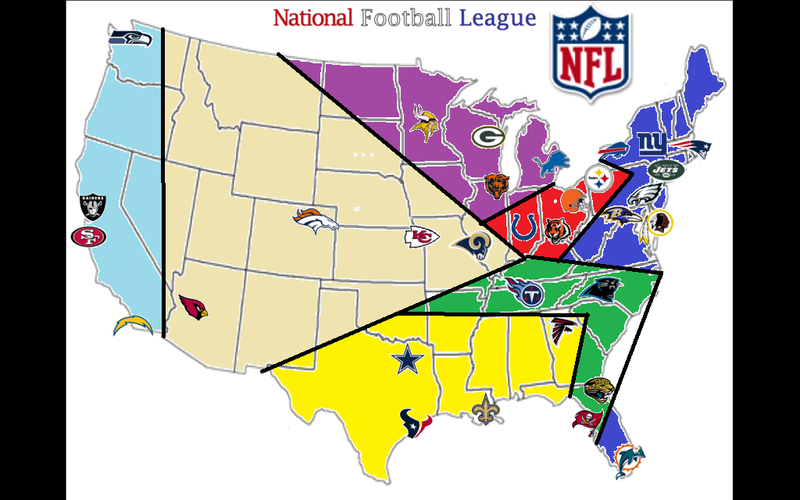 I don’t think it works as well, but I would also favor it over the current divisional alignment. 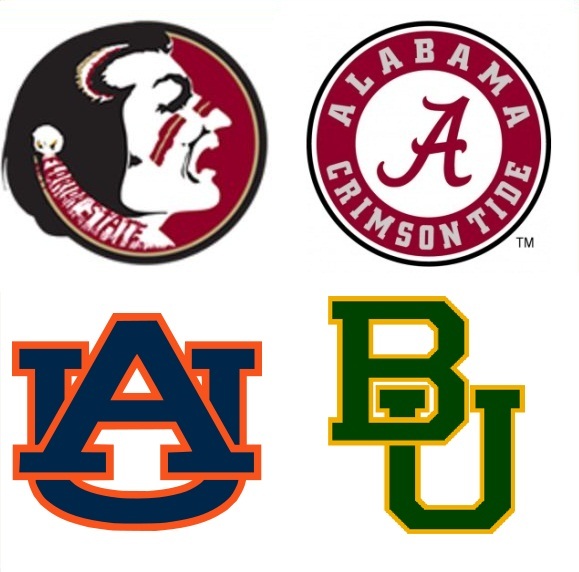 New look to the top 4, but Auburn and Baylor won’t have it easy in the coming weeks. It was a strange week on the field, so I guess it makes sense that it’s a strange week in my ratings. I don’t usually mention the full ratings except as an afterthought, but go here for the exact ratings of all the FBS teams. I also have strengths of schedule and Conferences and Divisions “standings” that may help explain the order of some of these. Only one team in my new top 25 (Stanford) lost, and they only fell 5 spots. Only two teams that I were in the top 25 previously and are no longer there won, and two of the previously-ranked (Northwestern and Michigan) were playing one another. So the dividing lines were fairly logical. The other team was Boise St., which I ranked in the preseason; but the Broncos have not appeared in the mathematical top 25 at all. Stanford, a one-loss team, fell out of my top four; but they were replaced by another, Auburn. 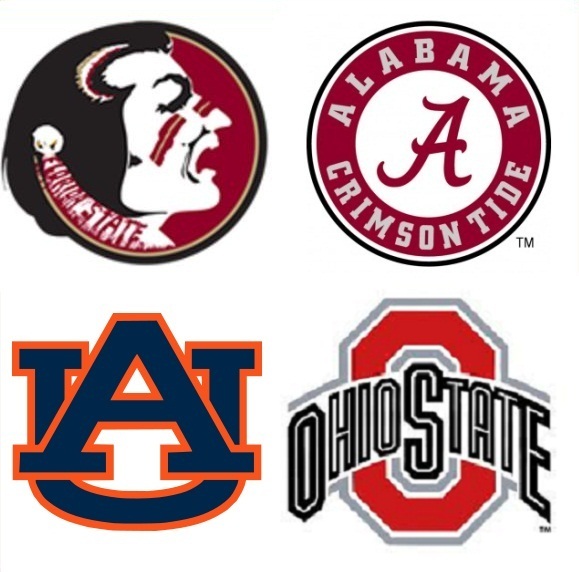 This isn’t really a problem since someone will lose the Iron Bowl (neither team will accumulate much credit next week since Alabama plays an FCS opponent and Auburn is idle), but I can imagine there are some Ohio St. proponents who might not be happy with that particular undefeated team being 5th. If you look at the best wins, it makes sense why Baylor is ahead. The Bears have beaten (currently) #18 Oklahoma, #45 Buffalo, and #46 Texas Tech. The Buckeyes, on the other hand, have beaten #21 Wisconsin, #51 Iowa, and #54 Penn St. If you get much lower than that, we’re not talking about teams that should present a serious threat to a top-5 team anyway. To be fair, sometimes there is just an unlucky team like #78 Northwestern who can seemingly play any number of teams close but just can’t seem to beat them. As their rating shows, that doesn’t translate into a lot of credit since my whole system is based on wins and losses. But the only reason I’m talking about Ohio St. is because they haven’t lost, so they’re benefitting from the same outlook. If both Baylor and Ohio St. win this weekend, the Bears’ lead will increase even more since Oklahoma St. is worth significantly more than Indiana is. 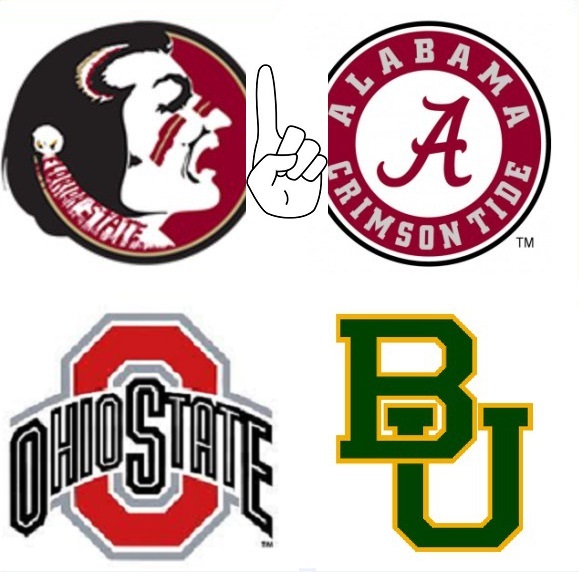 I think Baylor would pass up Auburn, but I can’t be sure if Ohio St. would. Ohio St.’s high-value games would come against Michigan and Michigan St. (who apparently will win the other Big Ten division). Baylor finishes its season against two currently unranked teams, although a fair number of points would be available as a result of beating Texas. Also, Ohio St. is still 4 spots ahead of Fresno St. and 7 spots ahead of Northern Illinois, so it’s not like my ratings are suggesting the Buckeyes’ schedule couldn’t be worse. But it does so happen that for a major team in a major conference, it’s not a very good schedule at all to this point. I have the Buckeyes’ schedule 92nd. It’s third-worst in the Big Ten (ahead of Michigan St. and Wisconsin); and among comparable conferences, the only team lower than Ohio St. is Oklahoma St., which finishes the season against Baylor and Oklahoma. There are some AAC teams lower than Ohio St., but I don’t consider that on the same level as the “Big Five” conferences. I also wouldn’t rule out Missouri moving up. I don’t anticipate the Tigers winning the next two games (which they must to assure their spot in the SEC championship in the first place), not to mention beating the winner of the Iron Bowl, but stranger things have happened this season. Even though I wasn’t cheering for USC, it was nice to have some validation for my ranking of the Trojans in the preseason. Ole Miss, another preseason pick, also joined the top 25 for the first time since I went to the computer rankings. Along with USC, another team coached by a former Ole Miss head coach, Duke, joined the top 25. I’ve ranked Duke before, but I don’t believe I’ve ever done so this late in the season. Louisville also re-joined the top 25 after its win over Houston. Alabama is still two points ahead of Florida St. Stanford’s win over Oregon propelled it into 4th, just barely ahead of Baylor. The committee changed a little bit. The non-partisan voter did not submit an entry, but we have a new voter who is a Ohio St. supporter. She’s a true believer, but I thought her poll was fairer than how some of the others voted. Also, the Oklahoma voter is back. This is the first time there have been 7 voters. The top 10 is about as expected despite the change. 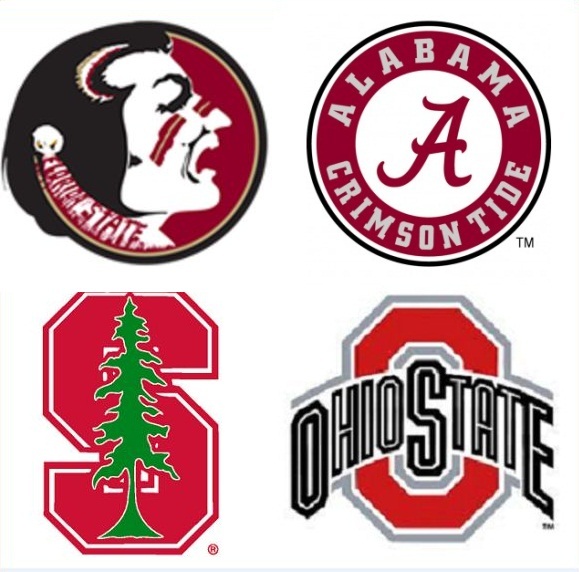 Alabama still clings to a lead by two points since the more pro-Ohio St. voters put Florida St. #3; and conversely, the pro-Florida St. voters put Ohio St. below #2. Oregon fell from third to seventh, and the rest of the top 9 remained in the same order. Baylor was placed in the top 4 by 5 of the 7 voters, but Stanford is still getting high marks as well, so the Cardinal stayed ahead. Both have substantial competition ahead though, so it’s far from settled. South Carolina jumping into the top 10 was unexpected from looking at last week though. I didn’t expect Oklahoma to tumble all the way to #21, although I do think it’s hard to argue that the big names from #20 to #25 should be any higher. Nothing else was too weird, except maybe for Texas A&M and Michigan St. going ahead of Oklahoma St. and Fresno St.
USC went up to 28th on the strength of just one vote. It is the Trojans’ first vote since I started this a few weeks ago. After the win over Miami, which had been 11th, Virginia Tech also rebounded well from failing to receive any votes last week. Duke, Texas St., and Notre Dame (obviously) are also only receiving the support from one voter apiece. Ball St. got support from two, but that may change given the Cardinals’ loss yesterday. I’m a little surprised that Ole Miss hasn’t gotten a vote yet. The Rebels lost to #1, #6, and #11 and have beaten #20 and #23. South Carolina, on the other hand, is #10 but has lost to two teams, neither of which has any points in the poll at the moment. The Gamecocks did beat #9 and #16, so they should be ahead by at least a little; but I don’t see them as (at least) 23 spots higher than Ole Miss. LSU probably varied the most from poll to poll. The Tigers were ranked as high as #13 but were also un-ranked by two of the voters. Anyway, despite some serious disagreements, I’m satisfied with the overall result. Logos in white boxes represent potential additions. The red areas are the current South Division, and the blue areas are the current North Division. 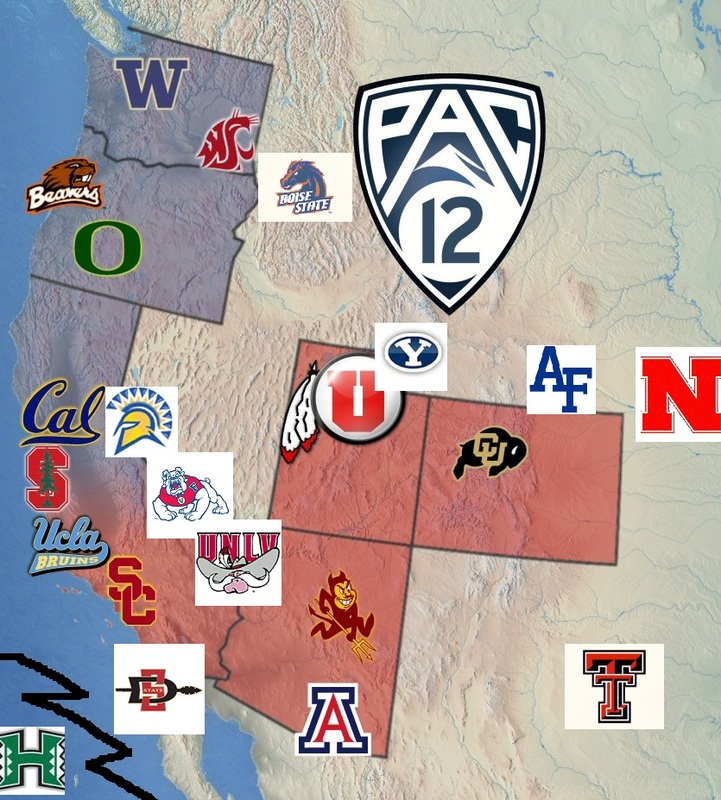 With BYU’s success as an independent team (despite losses to Virginia and Utah, the latter a recent Pac-12 addition), I still think the Cougars would be a good fit for the Pac-12. That’s the real rival for Utah–not Colorado, who doesn’t have a real rival in the Pac-12. I know the conference is expressing reluctance to expand, but it wasn’t too long ago that it was talking about 16 teams. Also, it doesn’t seem like that long ago that the Pac-10 and Big Ten didn’t want to expand, didn’t want a championship game, and didn’t even want to be involved in the BCS. Both wanted their champion to play in the Rose Bowl and for that to be the end of it. A few conferences seemed happy at 12 but have expanded/are expanding anyway. I still don’t understand why public “research universities” is such a priority for Pac-12 admission, but people always bring it up. I had never heard much about Utah or Arizona St. (or a couple of the more long-standing Pac-8/10/12 schools) being academic powerhouses. Anyway, I do know BYU is a good school (without so much research maybe), and since they’re unaffiliated and there are two schools in the Rockies unconnected with the rest of the conference, it seems it would fit. Although I don’t know anything about its standing among other schools academically (promotional materials seem to make their research sound impressive: http://www.depts.ttu.edu/vpr/), Texas Tech would be a good way to expand into the pool of Texas talent since it is in Western Texas, actually not very far to the East (although significantly to the South) of Boulder, Colorado. It was one of those potential additions to the Pac-12 when the Big XII nearly fell into pieces. How to align the divisions would be a challenge, although I do have an idea of how that could be done. Basically, take the 7 rivalry pairs and put all the more sophisticated schools in one division and the other schools in another. Washington St. and Oregon St. seem a little grittier than Washington and Oregon, the latter two being rivals of one other anyway. Stanford/Cal, USC/UCLA, and BYU/Utah are fairly obvious since the first one of each pair is private and the second public. I don’t think I have to elaborate on why Texas Tech is more rough-around-the-edges than Colorado. Just imagine Boulder, then imagine Lubbock. By reputation, Arizona seems a little more buttoned-down than Arizona St., but I’m not sure that matters either way. Colorado could have an even better rival in Air Force, although that doesn’t really expand the recruiting base. It may add to fan interest though. The service academies have fans scattered all over. Of course, Air Force also regularly played BYU and Utah when all three were in the Mountain West and WAC. The team right now is pretty bad though. You don’t always want to focus on the short term, but I think that would be a meaningful concern. The Pac-12 doesn’t want another doormat. Boise St. doesn’t have much of an academic profile, but that would seem to make for an easy transition. The Broncos already have the talent and interest to compete, and it would be natural to add them to the Pac-12 North and BYU to the Pac-12 South. I still think teams in Colorado and Utah being in the South seems a little off, but my understanding is everyone not in California wants to play in California at least once a year. Fresno St., UNLV, San Diego St., and San Jose St. could be other possibilities if academics aren’t a priority. UNLV and San Diego are big unexploited media markets for major college football (and in the case of UNLV, there are no major professional sports in the area either). I’m not sure how much San Jose St. and Fresno St. would add, so they’re probably least likely, but they make obvious geographical sense. There are half a million people in Fresno and no major sports in the surrounding area, where arguably another half a million people or more live. San Jose St. isn’t very far from Stanford, but not everyone is a Stanford person. Another possibility I thought of was Hawaii, which apparently does have some research credentials, but that program has crashed and burned since June Jones and Colt Brennan left the islands, so it has some of the same problems as Air Force, except I think Air Force has better road fans. Logistics aren’t very favorable for Hawaii either, of course. Nebraska is a long-shot, but I thought it worth mentioning. I don’t think the Big Ten is quite what the Huskers signed up for. If they have to play a 9-game conference schedule and travel to one of the coasts, why not the Pacific Coast instead? With Colorado, at least they would get one of their traditional rivals back. Maybe if they joined along with Texas Tech, that would be the best way of including new teams in a more logical way. As to how the divisional alignment would work, Utah could just be switched to the North and keep playing Colorado as a permanent opponent (or “protected series”, as the Big Ten calls it). Berkeley is about the same distance away as Tempe (Arizona St. is the second-closest Pac-12 South opponent for the Utes) is anyway. Nebraska would also help out the competitive balance in the long-run. I’m sure that would be a really expensive proposition though. I updated by LSU/Alabama series page. Feel free to get your top-25 votes to me. Also, I sort of have more of a focus on the top 2 and top 4 anyway. 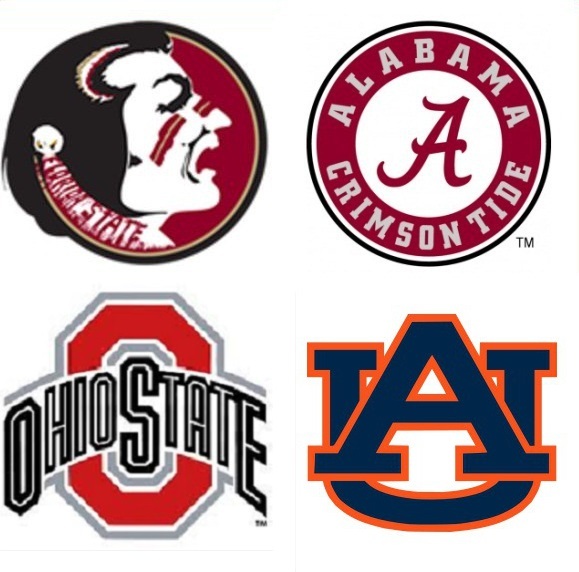 I don’t think anyone is going to rely on me as the great oracle of college football to make such decisions, but I like to imagine that my ratings would pick a good top 2 for national-championship purposes or a good top 4 for national-semifinal purposes. I feel vindicated about Stanford though. My ratings are not about who is going to beat whom necessarily, but they do serve as a reminder that teams don’t always earn their rankings in the major polls, not even after 10 weeks of play. Baylor won’t be high enough for most people’s tastes, but again, they have plenty of potential points on the table with Texas Tech, Oklahoma St, and Texas still to play. Major shake-ups took place toward the bottom of these ratings. One reason Texas A&M shot up so high was the fact that the Aggies have played Alabama but not LSU, Vanderbilt but not Florida, and Auburn but not Tennessee. LSU and Texas A&M are in the same division though. They play in just under two weeks. Minnesota’s improvement might seem a little more than is deserved, but by finally beating a competitive team in Michigan, Nebraska’s stature as an opponent increased considerably. The Gophers beat the Huskers two weeks ago. It also helped that numbers 14, 19, 21, and 24 all lost, while #22 and #25 earned wins that were worth very little. Texas hasn’t done anything really impressive lately, and I’m not sure Ball St. has done anything impressive at all (although I guess winning 7 in a row is nothing to sneeze at), but they’ve both been lingering just out of the top 25 for a few weeks, seemingly waiting for other teams to lose. This is the first time LSU has been out of the top 25 in nearly five years (Jan. 2009).